Defender Sonny Bradley didn’t for one second believe that the change in formation was to blame for Town’s first half capitulation at Peterborough on Saturday. The Hatters altered their system from the regular diamond to three at the back, but found themselves 3-0 down inside 40 minutes. 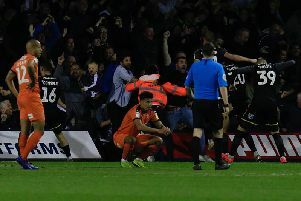 After boss Nathan Jones restored his go-to shape in the second period, Luton improved dramatically, pulling one back through Danny Hylton, but it was a consolation. However, Bradley didn’t point any fingers at the set-up, saying: “For me, the goals that we conceded don’t come down to tactics, it’s basics. “In the Football League, you’ve got to start games quick, especially away from home. “We knew before the game that they were going to start quick and get in our faces and we haven’t dealt with it. I know the manager feels we got it wrong with the formation, but I think the boys hold their hands up as well because we can’t start games like that. “We had a system and we put boys out that could deal with it, I think it’s just a case of sloppy goals and our bad times. “We can moan about formations and getting it wrong, but at the end it’s basics, it’s how we’ve conceded. It was the same for striker Hylton who said: “I think it’s an easy cop out that to say the formation wasn’t right or whatever. “At the end of the day, the goals weren’t because of the formation and if anything, the formation should have helped. Bradley felt there were harsh lessons to be learned from the opening half display to ensure the Hatters don’t find themselves in a similar position once more. He added: “We’re going into half time and the game’s already gone at 3-0. “We obviously started the game not well at all, we want to play so much, we want to create and go forward, we want to score goals, but first of all we’ve got to keep the ball out of our own net otherwise we’ll learn the hard way. “I think we were too open at times, going for a goal straight away in the first 10 minutes when sometimes you’ve got to make sure you don’t concede first time and then go and get the goal. “It’s a difficult day, a difficult one to take, as I think people turn round and say, are we the better football team? Although Town had a whole host of chances in the second period, with 21 shots in total, Bradley knew that meant little, adding: “It counts for absolutely nothing. “All that matters is the scoreline, anybody in football will tell you that.